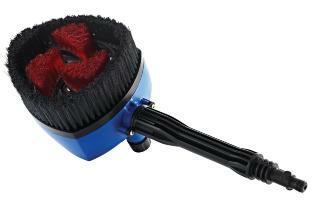 Multi Brush is a rotary brush for Nilfisk high pressure washer, on which the inner rotating brush head can be changed for different cleaning tasks. Multi Brush has a built-in tank for variable application of detergent. Nilfisk Multi Brush 3-in-1 is suitable for all Nilfisk pressure washers. The video clip shows different applications and also how easy it is to change brush head.